What ‘secret weapons’ do airports use to make passengers happy? For my most recent “At the Airport” column on USA TODAY, I asked some of the ‘winners’ in the most recent JD Power suvey to share what they think makes their airports stand out against others. Airports around the country are dealing wiht record high passenger volumes and a wave of major terminal construction projects. Yet, U.S. airports are doing a bang-up job of pleasing passengers. That’s the major take-away from the 2018 North America Airport Satisfaction Study recently released by J.D. Power, which ranks everything from airlines and airports to electronics and cars. The study says travelers’ overall satisfaction with airports is at a record high, based on factors such as terminal facilities; airport accessibility; security check; baggage claim; check-in/baggage check; and food, beverage and retail. Of course, some airports rank higher in the study than others. And when we quizzed ‘winners’ about the secrets to their success, “a commitment to customer service” emerged as a universal theme. But so too did did a keen, good-hearted sense of competition. Among ‘mega’ airports – those serving more than 32.5 million annual passengers – Orlando International Airport (the 2017 category winner) and McCarran International Airport in Las Vegas tied for first place. 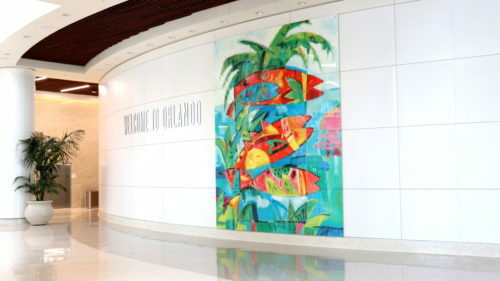 The airport is meeting milestones in its $4.27 billion Capital Improvement Plan and has completed a variety of ‘passenger-pleasing’ projects ranging from improved Wi-Fi and baggage systems to a people mover system that transports passengers over waterways and landscape that evoke the Florida sense of place. When McCarran International Airport (LAS) landed in the number 3 slot in J.D. Power’s ‘mega’ category last year, Rosemary Vassiliadis, Director of Aviation for Clark County, Nevada, gathered her team together to strategize how to move up to first place. To gain its first-place tie this year, LAS teams focused on upgrading terminal spaces, smoothing out checkpoint experiences and perfecting the “You’re in Vegas” vibe that includes slot machines, a neon “Welcome to Las Vegas” sign, and a curated “Voices of Vegas” taped music program highlighting iconic Vegas acts and songs that name check the city. At Detroit Metropolitan Airport (ranked third in this category this year) logo welcome mats have replaced industrial black runners. DTW officials also credit high passenger satisfaction ratings to amenities such as new nursing rooms, water bottle refill stations and light fixtures that can be programmed with seasonal and sport-team colors. At Denver International Airport, which placed fourth in the ‘mega’ category this year, the secret to success is always looking for ways to “surprise and delight passengers,” said airport spokeswoman Emily Williams. DEN offers everything from a Canine Airport Therapy Squad (that includes a cat) to airport events in an outdoor plaza that have featured a beer garden and an ice-skating rink. And during its current terminal renovation project, DEN is having success delighting passengers with a series of “Pardon our dust” messages that embrace the conspiracy theories and rumors of alien inhabitants that date back to 1995, when the airport opened. Among ‘large’ airports serving 10 million to 32.4 million passengers California’s John Wayne Airport, in Orange County, ranked highest this year; Dallas Love Field ranked second and Oregon’s Portland International Airport ranked third. With a departure curfew, passenger and flights caps and just 505 acres, “We’re a postage stamp of an airport, but passengers like our airport’s convenience.” said Deanne Thompson, spokeswoman for John Wayne Airport (SNA), which is located about an hour from LAX. The airport offers a live weekday lunchtime music performance program, permanent and changing art exhibitions, a public piano, a children’s play area and information booths that are staffed from 5 a.m. until the last flight. And at Oregon’s Portland International Airport, passengers enjoy the wide selection of local and regional shops and restaurants, true street pricing and a suite of amenities that includes a free movie theater, said PDX spokeswoman Kama Simonds. Among medium sized airports – those serving between 3 million and 9.9 million passengers – this year Buffalo Niagara International Airport ranks the highest, followed by Indianapolis International Airport and Fort Myers/Southwest Florida International. 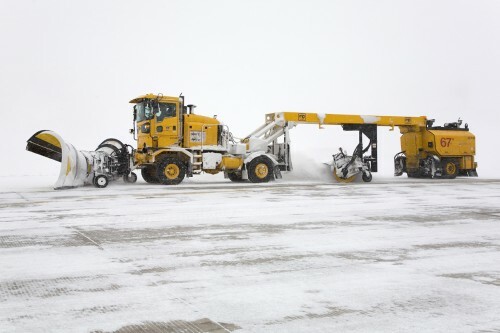 In addition to focusing on customer service, “We also do things that go above and beyond,” said Kimberley Minkel, executive director of the Niagara Frontier Transportation Authority, which operates the Buffalo Niagara International Airport. The airport has a branch of the Anchor Bar where Buffalo chicken wings were invented and the second largest ‘Paws of Love’ therapy dog program in the country. Thanks in large part to BUF’s award winning snow removal team, the airport never closes. Among its ‘secret weapons,’ Indianapolis International Airport cites its bright, wide-open spaces and amenities such as human-powered charging kiosks and an extensive permanent and rotating art exhibition program. Events at the airport often mirror what’s happening in town: i.e. during Indianapolis 500 season, IND hosts a panel with drivers sharing stories of their racing experiences. Do you agree with these rankings? And have you noticed these ‘secret weapons’ employed?